Ten years ago, conversations around managing wealth for high net worth individuals (HNIs) and ultra HNIs started to move from which product, stock or bond to buy to a simple detail around asset allocation. This discussion got accentuated post demonetisation with greater emphasis on financial assets over traditional real estate and gold. As the industry matures further, the discussions are now about greater value addition for clients by introducing real-time portfolio analysis with the help of technology. According to the latest Global Wealth Report from Credit Suisse, the top 1% Indians hold around 52% of the country’s wealth and the top 10% hold around 77%. The report also estimates that the current number of dollar millionaires in India is at 343,000. $1 million is roughly ₹ 7.35 crore. Moreover, of the 149,890 adults classified globally as ultra-high net worth (with net worth above $50 million), an estimated 3,400 are in India. Unlike in Europe, this number grows every year for India. Not just HNIs, but even the urban mass affluent with a portfolio amount of ₹ 1 crore or more are getting into the radar of these services. Thus, demand for wealth advisory or private banking undoubtedly is also set to grow. Technology will enable better client experience and reach mass affluent individuals with similar quality of advice which till now was accessible only to HNIs. Many firms are setting in place technology platforms needed to support this potential growth. 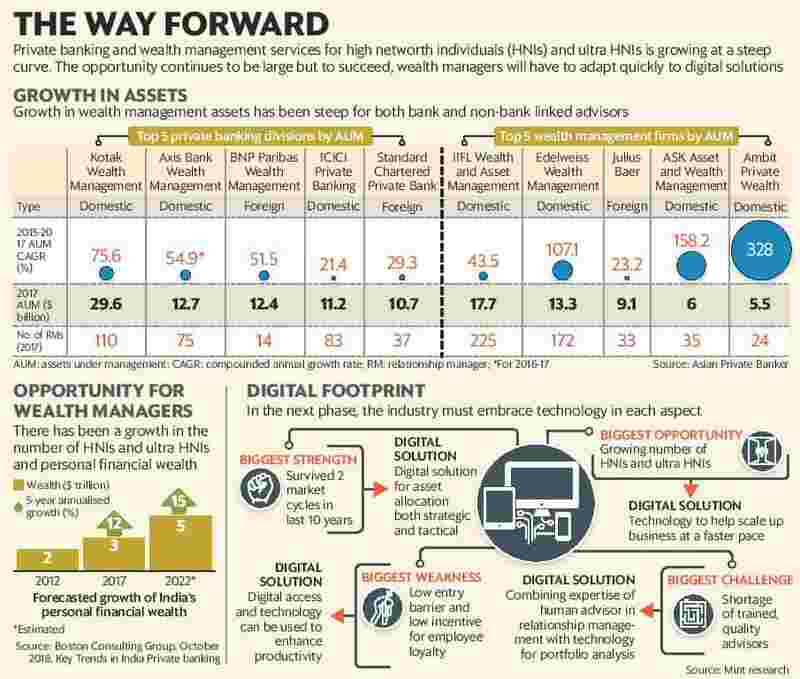 But are domestic wealth managers ready to embrace it and scale up, given that challenges of the previous decade remain? In the market crash of 2008-09, nearly 50-80% of (equity) portfolio values got wiped out. This included advised portfolios. Despite the pain, the global financial crisis, in hindsight, was an inflection point for the growth of domestic wealth managers. Post the crisis, thanks to a reorganisation of priorities, many foreign bank-linked wealth and private banking services packed up in India and domestic wealth management firms, thus, got a booster shot. According to Shiv Gupta, CEO, Sanctum Wealth Management, “While foreign firms tried to bring in best practices, adhering to some international regulatory requirements was often impractical (and unnecessary) in the domestic market context." In 2015, Gupta concluded a first-of-its-kind management buyout of the Coutts Private Banking business in India (under Royal Bank of Scotland) and has since transformed it to Sanctum Wealth Management. The objective was to have the flexibility and agility of a domestic set-up along with global standards in governance. It’s in this period, after the world had recovered from the crisis, the emphasis quickly shifted to asset allocation. Asset allocation is the practice of having some money invested in different types of securities and assets like equity, debt, real estate, through structures like mutual funds, PE and VC funds, debentures and so on. “After the losses in the financial crisis, for the first time there was appreciation in advisory. People were willing to accept a more comprehensive plan with inclusion of concepts like asset allocation," said Sandeep Jethwani, managing partner and head advisory group, IIFL Investment Managers. While it was a more useful approach for clients, it came with inherent challenges. Firstly, it required more time and better skill from the simple relationship manager or advisor. Secondly, the demand from clients for quality advice was more than the supply of quality advisors, perhaps still is. According to Anshu Kapoor, head-private wealth management, Edelweiss Financial Services, “The industry so far hasn’t really been able to create talent; advisors move from one outfit to another but focus on creating this talent at the right cost structure is missing. This, in turn, limits the ability of an organisation not only to expand beyond the top cities but also to deliver consistent and standardised advice across clients who may be in any city." Asset allocation models led to open architecture strategy; wealth managements firms advised clients on products across the spectrum of manufacturers. This requires more knowledge and skill on behalf of the advisor. Currently, advice delivery is still a bit like Chinese whispers rather than quality assembly line, and reliance on in-house products continues to weigh heavy. Rajesh Saluja, managing director and CEO, ASK Wealth Advisors, said, “The concept of open architecture was introduced in India mainly by foreign banks. Over the last decade, many local players have focused on building in-house asset management to launch proprietary investment products and maintain margins. Proprietary investment products also work as a hook to acquire new clients by showcasing a differentiated proposition. Conflict of interest can be managed if the rationale for recommending an in-house product is based on demonstrated product performance or a strong value proposition." About two months ago, Wadhawan Global Capital announced the launch of its wealth management business, WGC Wealth. With 100 or so advisors on board, the wealth manager is starting out big. Atul Singh, CEO of WGC Wealth has set an objective to democratise, or make accessible high-quality financial advice to many others that until now was available only to the wealthiest 1%. Two older wealth management firms are readying themselves for listing on stock exchanges. But the challenge to provide quality advice in a standard format without compromising the ability to grow remains. Relationship managers are limited in their ability to conveniently drill down details by themselves. The time taken to do this manually for each client also limits the scalability of the business. “Asset allocation ideally should be applied not only at a broad product level but also get percolated to the level of a single security. If a particular stock is crashing, an advisor should be able to tell the client the total exposure in that particular stock or bonds of that company across mutual funds, (portfolio management service) or alternative investment funds (AIFs) that the client holds, in real time. The way things work today, it can take 2-3 days to come up with this detail, but application of the right technology makes this analysis available at the push of a button," said Singh. Despite the challenges, one can’t ignore the opportunities. According to a recent report on Key Trends in India Private Banking by Boston Consulting Group, India’s personal financial wealth at $3 trillion can grow to $5 trillion by 2022. That is 13% annualised growth for personal wealth; making the case for personal wealth advisors stronger. This includes the mass affluent investor too. At around $170 billion, according to an Asian Private Banker report, the assets under management (AUM) of the top 20 Indian firms advising wealth management to HNIs is still a very small proportion of the estimated accessible wealth. At the moment, technology is used more for executing transactions and getting a client started rather than analysing products and portfolio allocations. If the latter gets incorporated, many more clients will get access to the same quality bespoke advice that HNIs get at no incremental cost for the wealth manager. Going ahead the firms that are able to leverage technology to influence processes in a manner that complements the advisor’s skills and saves time—thus, improving productivity—are going to have an edge. According to Jethwani, the focus is on process-based delivery towards money management and not just product-based execution. “It frees up time for the client. We use technology for portfolio level analysis of deviation from risk, return expectation, monitoring liquidity and so on. The advisor has more time and an improved bandwidth for growing the business," he said. IIFL Wealth Management has recently started IIFL One, which aggregates various services into one platform, and that’s been made possible by optimum use of technological tools for analysis and delivery. It’s an all-in-fee platform, where product based commissions are eliminated. Competition will make digitised back-end processes and client-facing digital applications which improve value addition, a basic hygiene for wealth managers. One risk is that firms could over-complicate the product suite by offering too many structures and strategies which are not needed. Perhaps that is where human intervention will not be replaced, in deciding when to say no to the next product. Saluja said, “In the HNI segment, technology can be used to acquire and serve clients at a fast pace thereby helping grow business. For the ultra HNI segment, where nuances of money management are not as simple, advisor personal interaction will remain primary." For the mass affluent and HNIs, greater reliance on technology will be imperative to grow the business. While talking about setting up WGC Wealth, Singh said, “The focus for the first six months was on getting the technology platform right. We expect advisors to acquire clients, deliver high-quality service and also be financial wizards, guarding the client’s financial well-being. Without right enablement, it is difficult to do all three. This is where technology can support them in delivery of high-quality investment advice through automating portfolio analysis and driving timely insights." What technology will not replace is the trust and relationship that an advisor builds. Not every advisor’s business model will be inclined towards building scale; an independent advisor may be satisfied with a few UHNIs, similarly a family office may restrict itself to 5-10 large families. Nevertheless, those who aspire for scale will have to adapt better to technology and add technology-based solutions for clients, replacing not the advisor, but at least the traditional excel sheet analysis. If you don’t consider yourself in the HNI paradigm yet, the good news is that all the innovation will sharpen outcomes on portfolio strategy and analysis, and some of it will percolate to digital platforms and applications available even for the beginner investor.